On the “Out of the Box” menu this week we have more PaleyFest panels, lots of floral inspiration for spring, a good dollop of shimmer and a reunion that’s making me feel a lot of things. By now you will probably know how I feel about Evan Rachel Wood in a ladysuit – strongly positive – and this Cavalli is no different. The ruffled shirt is a fun twist and this overall vibe is a killer look that never gets old. Erdem florals for Thandie Newton mixing delightful levels of print (she put a bird on it) with a good level of shimmer and sparkle. This is a hard level of whimsy to work without falling into the too twee trap, but Newton is doing just that. Excellent PaleyFest panel attire from my fave Westworld robots. More botanicals and both Kirsten Dunst and Charlize Theron are in Gucci at CinemaCon; they’re different enough prints to not feel like they’re matching and yet there’s an element of coordinating (especially when you factor in the strappy heels). Kirsten Dunst also went to a Britney show this week and this Instagram post is everything. This week’s column includes a whole lot of the TV Ate My Wardrobe style ultimates and Jessica Chastain is ticking the rocks a lot of polka dots box in Givenchy with added ruffles. The real bonus here is the yellow pumps, which are fabulous. 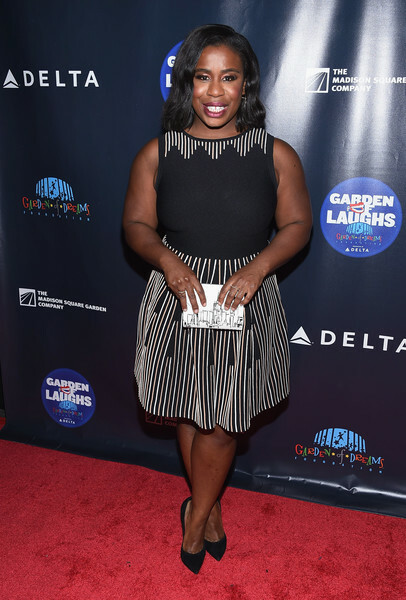 Uzo Aduba gives great black and white ensemble at the 2017 Garden Of Laughs Comedy Benefit; her clutch is very cute, but I would love to see Jessica Chastain’s yellow pumps with this look instead. A very busy time for Alison Wright at the moment as she’s crushing it (and me in the process) on Feud, making surprise appearances and performing on Broadway. At the Sweat opening night party she looks incredible in a Balmain mini dress and continues to give me so much eyebrow arch envy. 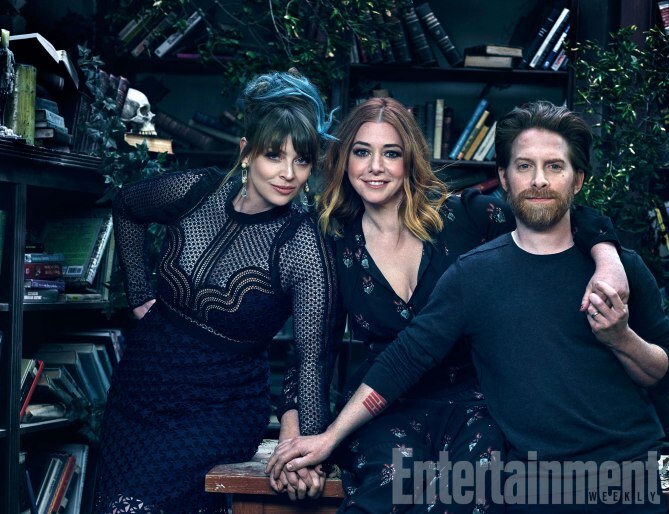 Wednesday afternoon involved a whole lot of feelings when Entertainment Weekly unleashed their Buffy the Vampire reunion cover story and this shot of Amber Benson, Alyson Hannigan and Seth Green is too much to handle without taking a moment. The returning shows keep on coming and so do the cast reunions on this week’s “Behind the Insta-Scenes.” Plus costume treats galore and other on-set antics. Jane the Virgin is back (!) and this lady will be guest starring soon (!). It is all the better knowing Rogelio will be involved somehow. And now a message of love from the Jane the Virgin cast. ITS AIRING!! SEASON 2!! YAY!! Viewing party treats and this cast is all over Instagram for your Jane fix. Petra’s getting pregnant cons list is long and includes maternity clothes, but now I want to see what costume designer Rachel Sage Kunin would stir up in this department. Meanwhile here is a regular costume fitting (this dress is fabulous) and Entertainment Weekly has more behind the scenes snaps courtesy of Yael Grobglas. Game of Thrones costume sneak peeks courtesy of Emilia Clarke. And for a moment I thought Daenerys was going to be rocking a knit beanie this season (not really, but the wig net does look like winter head wear). Look who else is in Spain. Possibly a coincidence, probably shooting Game of Thrones (as well as selfies). Oh hey Team Marvel (on Netflix) at New York Comic-Con. Killer cheekbones alert at NYCC from this Jessica Jones duo. NYCC also led to a couple of TV reunions which made me feel all the things. More Buffy treats from Sarah Michelle Gellar with this take on National Angel Food Cake Day. Yep that is a day apparently and I like this version better. America Ferrera’s old co-workers can’t keep away and I’m keeping my fingers crossed for Judith Light or Vanessa Williams next. More glasses to add to the covet list and trailer fun times from Sleepy Hollow. Production has started on season 4 of The Americans and Holly Taylor shared this spy like shot of the first table read (she also posted a clearer look at the table read set up on Twitter). #theleftovers season 2 that's a wrap !!!!!!!! For us The Leftovers has only just started, for the actors they just finished filming the finale. Will we find out the backstory of the wedding dress gardening woman? And how she manages to keep it so clean while doing a task like this. Tryna' get it done today, but my co-worker is waaay too cheerful. Digging Sherlock’s stripes and less than a month until Elementary is back. Gabby Sidibe’s caption just made me laugh a whole lot. It kinda looks like Taraji P. Henson and Jussie Smollett are reacting to Gabby’s previous photo. Instead they were watching Empire and this really could be in reference to any number of scenes. A treasure trove of patterned and colorful garments for Mindy Kaling to try on for a Mindy Project fitting. My eyes are instantly drawn to the starry number.